Disruptive evangelist fueled by a passion for trans-formative business partnerships Your efforts are only as strong as the data that fuels them! Connecting Marketing, Sales, Credit and Collection to empower business. Ditch your department silos, spreadsheets, and games of phone tag. Get your team on the same page with effective segmentation and prospect targeting, streamlined sales and lead qualification, credit decisioning and portfolio management, and collection queue and alerts. BusinessConnect is the only app that connects the most important revenue functions of your organization, all on the Force.com platform. We are maximizing value at every stage of the customer life-cycle to empower your business. Our sole purpose is to power organizations and individuals around the world by transforming knowledge into insights that help make more informed business & personal decisions. Headquartered in Atlanta, Ga., Equifax operates or has investments in 24 countries in North America, Central and South America, Europe and the Asia Pacific region. It is a member of Standard & Poor's (S&P) 500® Index, and its common stock is traded on the New York Stock Exchange (NYSE) under the symbol EFX. Equifax employs approximately 10,100 employees worldwide. 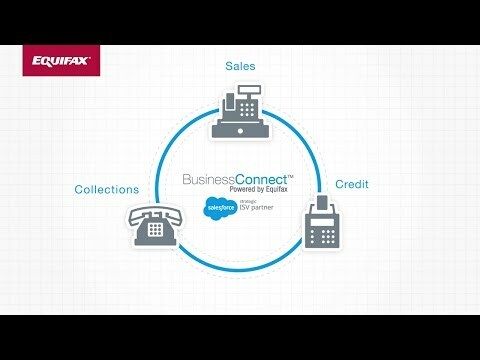 BusinessConnect is the only marketing, sales, credit and collections app that connects the most important revenue functions in your organization—Marketing, Sales, Credit and Collections—all on the Force.com platform. Ditch your departmental siloes, spreadsheets and games of phone tag. Get your team on the same page with effective segmentation and prospect targeting, streamlined sales and lead qualification, credit decisioning and portfolio management, and collection queues and alerts—with BusinessConnect you’re empowered to maximize value at every stage of the customer lifecycle. The Equifax Vision is to be the global leader in information solutions that creates unparalleled insights to solve customer challenges. Good corporate governance is vital to meeting our performance goals by ensuring that our governing processes run smoothly and efficiently and we are prepared to adequately and timely meet the challenges and opportunities posed in our competitive environment. Equifax is committed to act with integrity in all that we do. We adhere to the highest levels of ethical business practices, as embodied by the Codes of Ethics and Business Conduct for our directors, officers and employees. On the following pages you will find our fundamental governance documents which exemplify the way that Equifax conducts business on behalf of its shareholders, customers, suppliers and associates. At Equifax, good corporate governance is a way of life. Disruptive evangelist fueled by a passion for trans-formative business partnerships... I own a documented track record of rewards and accolades for consistently exhibiting Senior Sales Thought Leadership, value communication, and Sales Coaching. I approach the sales cycle as a consultant and utilize my ingenuity to help solve my customers' problems and address their needs. As a by-product, I own a reputation for forging strong long standing trusted advisory relationships. I have proven that putting in extra hours of work & study, coupled with innovative problem solving earns a permanent seat at my customers' proverbial decision table. "Until customers are engaged, everything else is just noise." Hear the importance of customer engagement and how Equifax is merging sales with marketing to streamline brand awareness and build relationships with each and every client.